Beds are named after their different sizes, so a queen bed is certainly a huge bed having large dimensions on all sides. Queen bed directly refers to the bedroom, and it is an essential part of your bedroom. It can safely be said that a bedroom is not complete unless it lacks a queen bed. We are familiar with the fact that such furniture articles are pretty expensive out there in the market. When I was not into the recycling, I used to spend a lot of bucks on such furnishing items. It was really a hard time as they always drained my wallet so rapidly. But this recycling thing has literally transformed my life, I just plan to make furniture articles and execute my plans by recycling the wooden pallets. 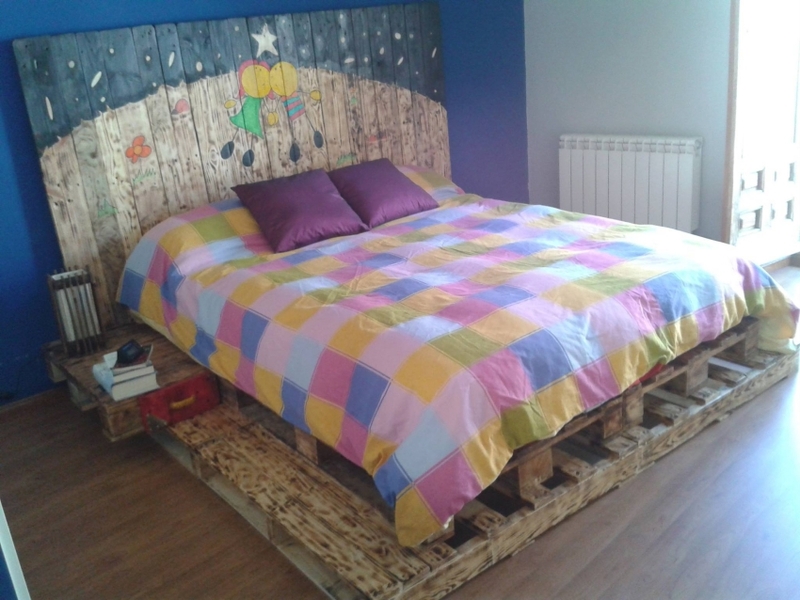 So here is another amazing recycling plan where you can make a queen bed out of wooden pallets for your bedroom. I am pretty sure that you would love it more than conventional market based beds. Here is the planned queen bed project of the day. 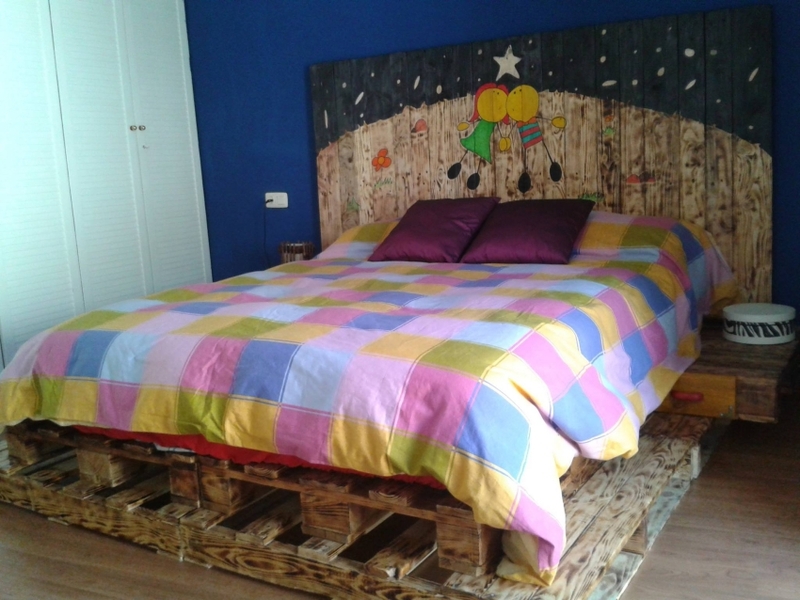 Just some raw wooden pallets are used to make this wooden beauty. Look at this queen bed, it is in no way lesser than a market based expensive wooden master bed. The basic frame is recycled using some fine raw pallets. While the back headboard is upcycled with some straight and slim pallet planks. 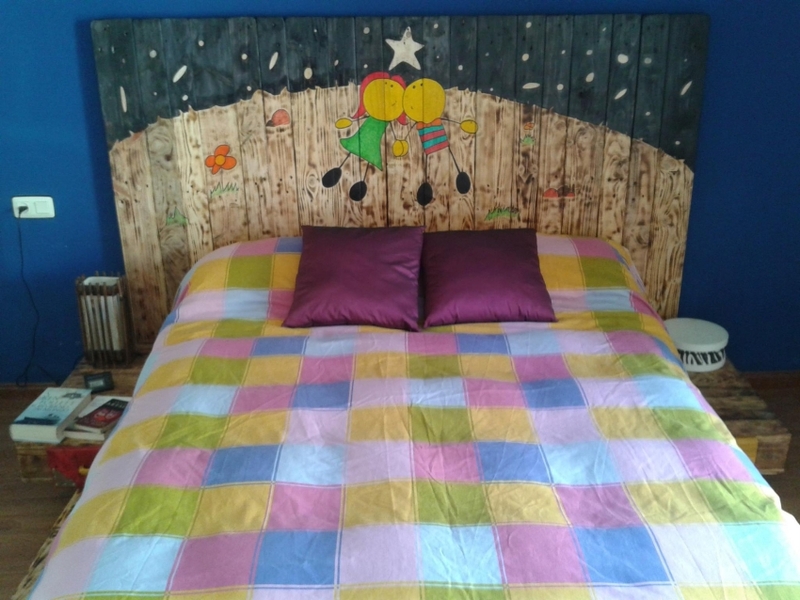 The headboard is painted with some kids art caricatures which would lure your kids a lot. The upper layer is painted as dark blue which reflects a sky full of shining stars, while the rest lower portion is left unstained. There are also side tables of the queen bed which are quite low on the ground. They could be used to place some accessories like your books or a night lamp.